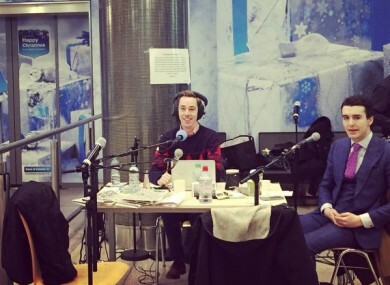 HUNDREDS OF PEOPLE were briefly evacuated from Terminal 2 in Dublin Airport this morning – including the staff of The Ryan Tubridy Show, who were about to begin a live broadcast from the terminal. The incident happened at 8.52am, less than ten minutes before the live broadcast was due to begin. A spokesperson for Dublin Airport told TheJournal.ie that a smoke alarm had gone off in Terminal 2 and that the building had had to be evacuated while the alarm was investigated. It is believed that the alarm could have been triggered by someone smoking in a toilet in the building. When The Ryan Tubridy Show began on RTE Radio One at the usual time after the 9 o’clock news, the host began the show by joking about what had happened. “You know, it’s been the easiest morning,” he told listeners. “We’ve been sitting here for ten minutes, nothing happened. No-one was smoking in the toilet upstairs, it was just fine.No-one was cleared out. It took approximately ten minutes before people were allowed back in to the building. It is standard procedure at Dublin Airport to evacuate in the case of alarms. Email “Dublin Airport evacuated - just seven minutes before The Tubridy Show was due to broadcast from Terminal 2”. Feedback on “Dublin Airport evacuated - just seven minutes before The Tubridy Show was due to broadcast from Terminal 2”.